The animatronic of five nights at Freddy's have taken over the Bikini Bot characters to force the security guard to transform him into an animatronic. The player must be very attentive to the movements of the animatronic to neutralize their attacks and prevent them from becoming one of them. Can you survive 5 nights with SpongeBob SquarePants?. 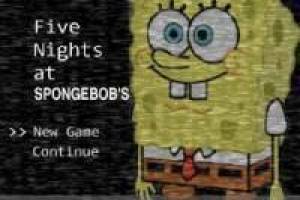 Enjoy the game Five Nights at Spongebob, it's free, it's one of our Freddy games we've selected.